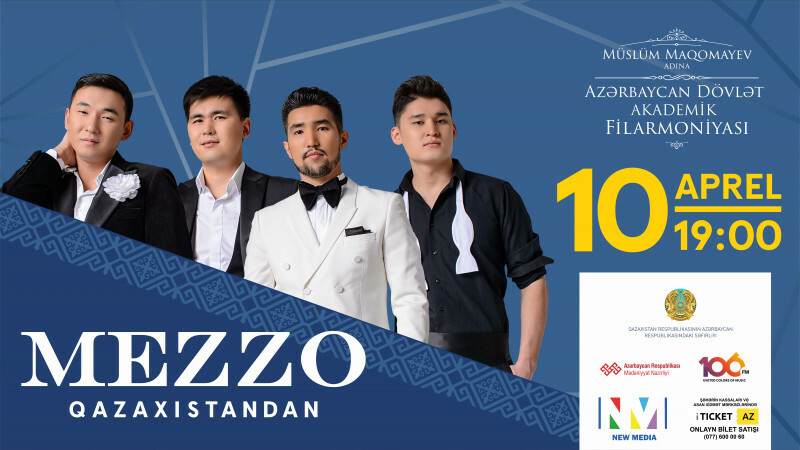 Concert of the Kazakhstan musical group Mezzo in Azerbaijan State Academic Philharmonic Hall buy tickets online. Delivery of tickets for the event Concert of the Kazakhstan musical group Mezzo. Mezzo is a popular group in Kazakhstan to perform in the classical crossover style, a combination of opera and classical music with pop. Founded in 2012, Mezzo consists of four young singers who perform in several different languages, singing covers of songs by artists like Andrea Bocelli, Il Divo, Josh Groban, Alessandro Safina, Elton John, Elvis Presley, Frank Sinatra, in addition to works they've written themselves. All classically trained, the soloists of Mezzo are able to take pop hits and give them a refreshing new twist, using their musical talent and mastery of operatic technique to make every song their own. The group successfully tours both in Kazakhstan and abroad. Young talents were warmly welcomed by the audience in Astana, New York, London, Cairo, Kiev.